ONE VOICE is a new young and vibrant girls band adding a fresh flavour to the music industry. With songs varying from up tempo pop with a twist of rock to all time favourite ballads, the compilation of originals and covers could be defined as intelligently tasteful and charming. The band consists of members Carla Strauss, Kalinka Kilian, Janke Bester and Karma Coetzer, all from Pretoria and Centurion. The girls started singing together over just a year ago realising they were the perfect vocal match with personalities and charm that keep audiences intrigued, wanting more. 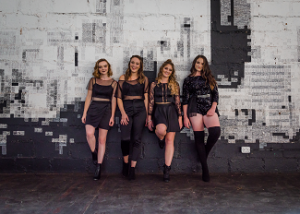 Audiences will be entertained by much loved covers songs such as Ugly heart by G.R.L. and Secret love song by Little Mix as well as newly written songs in Afrikaans and English. If you love the combination of great dancing and singing on stage, this is the right kind of entertainment for you.